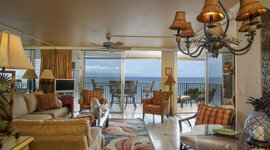 It’s not always easy finding the best place to stay in Maui with your family. There are so many great options. But all families are different. You might like being at a big resort with lots of action – waterslides, spas, restaurants. Or, maybe you’re into something with a more mellow vibe, a low-key place to hangout on the beach. Napili Shores really is one of those hidden gems. It’s located right above Napili Bay, a secluded beach cove with great snorkeling and boogie boarding. It might be a little farther away from everything in Lahaina and Ka’anapali, but the crowds are certainly less. And then there’s the famous Gazebo Restaurant. Tucked beside the pool, this family-friendly restaurant is known for the best brunch on the island. You can also grab dinner at the Hawaiian-style BBQ restaurant, Iron Imu. You’re right across the street from two PGA courses at Kapalua Golf Club, and up the road from fine dining and designer shopping in Kapalua. Stay here if: You want a smaller resort on a secluded beach and don’t mind being a little farther. Aina Nalu offers something that a lot of other Maui resorts don’t – a prime location in the heart of town. 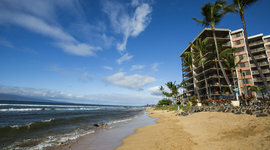 The resort is a few blocks from dozens of local restaurants, art galleries, monthly block parties, and two great luaus. You can even rent bikes to explore a bit further. 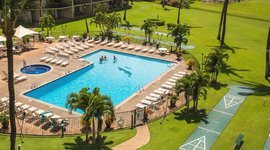 Besides all the great things to do nearby, the resort has a beautiful pool, surrounded by a grassy lawn. 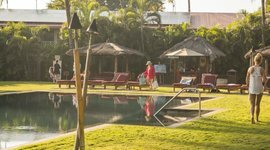 It’s a smaller resort with a close, community vibe and good for both families and couples. Though you’re not on the beach, nearby Baby Beach offers calm waters for swimming and snorkeling. 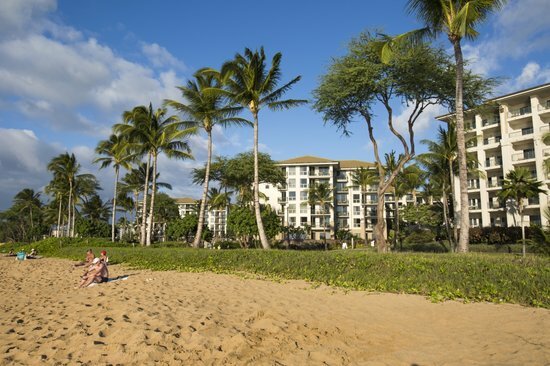 It’s a big resort with tons of action, right on the main strip of Ka’anapali Beach. There are several pools, one with a pirate ship playground and another with a waterslide. The Kidz Club is handy if you need a couple’s day. And hey, maybe treat yourself to an oceanfront massage in a beach cabana. As far as dining goes, there’s a fiery grill, two pool bars, and a market/deli. Whalers Village mall is a five minutes walk down the beach path. You’re also next door to Ka’anapali Golf Club if you find yourself wanting a golf day. This is where you come to get away from it all. Picture lush gardens of hibiscus and palms, shaded by palm trees swaying in the gentle tradewinds. No shouting, no chaos in the pool, just the sound of the waves. You can relax in the oceanfront pool, or venture into the reef offshore. Nearby you’ll find a local farmers market and a beach park, great for picnics, all in walking distance. You won’t find many younger kids here, as Hololani is best for families with adult kids, groups, and couples. Stay here if: You value peace, quiet, and a place with a neighborhood feel. This resort combines two great things – family and luxury – and does it quite well. For adults, there’s a deluxe spa that beyond massages offers hot stone treatments and a cleansing Himalayan Salt Room. Kids will love the huge pool area with a waterslide in the middle, not to mention the beach, a few steps away. 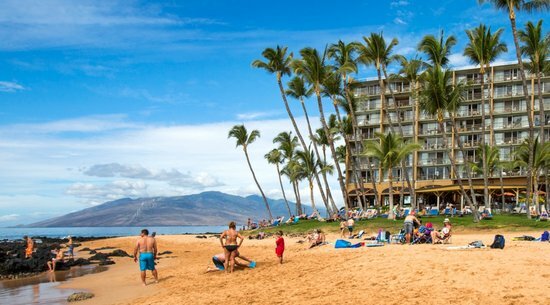 Honua Kai is home to Duke’s Beach House where you can dine directly on Ka’anapali Beach. There’s also a gourmet market with groceries, essentials, and a decent wine selection. You’re across street from a local shopping area with a few stand out restaurants (try the quirky Java Jazz), and a snorkel store. Stay here if: You want a luxury resort that caters specifically to families. 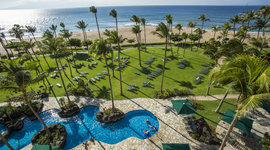 Directly on Ka’anapali Beach, this action-packed resort has lots to do for kids and adults. The adult pool overlooks the ocean with a shaded place to relax, and the kids pool includes a huge pirate ship playground. You have three restaurants to choose from, along with a marketplace where you can pick up groceries. 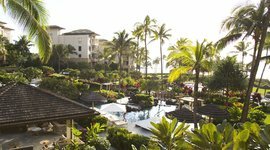 Westin Kaanapali is home to Spa Helani offering a variety of treatments and special massage cabanas. You can walk five minutes along the beach to snorkeling at Black Rock or drive 10 minutes to shopping and dining in downtown Lahaina. Stay here if: You want a big resort with tons to do on a popular beach. Play a family game of bocce ball as the sun sets over the ocean. The seaside lawn is seriously huge, with lots of space for the kids to run around. At the end of the grass, you reach a calm beach that feels almost private. Here you can snorkel and swim. 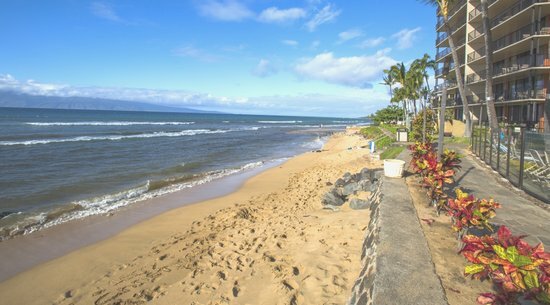 You’re a five-minute drive from downtown Kihei, a local surf town filled with plenty of shops, restaurants, and bars. And true to the resort’s name, the sunset really is spectacular. The lawn gives you an excellent, obstructed view of nature’s lightshow. Stay here if: You want lots of space for the kids to run around. It’s the final resort on the very tip of Ka’anapali Beach. So it’s not quite as crowded as the main strip. Kids can play in the oceanfront pool, while you enjoy a drink and lounge. They also offer a year-round kids camp so you can take a day off. The ocean is steps away and there are five restaurants in walking distance along the beach. Across the street is a mini mall with shops and a few restaurants. Many of the residences here were recently renovated with granite counter tops and tile floors. 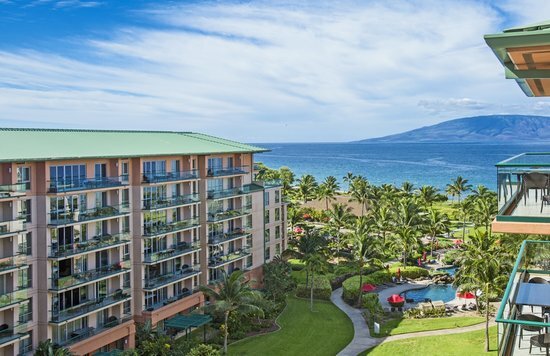 Stay here if: You want Ka’anapali Beach without the crowds. Mana Kai is all about the beach. So much so, that it’s surrounded by a peninsula of sand. 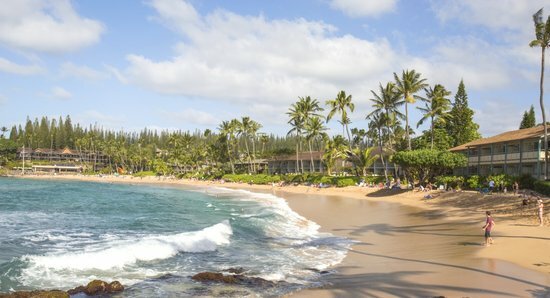 Keawakapu Beach stretches for a mile, with only a few smaller resorts along its shore. You have room to spread out, without worrying about bumping into the crowds. From the seaside lawn you can grab a lounge chair and admire the ocean panorama and spot the island of Lana'i in the distance. Kids can play in the water and you can all rent snorkels at the resort and explore the reef that clings to the lava rocks off-shore. There’s also 5 Palms restaurant, serving brunch, lunch, and dinner with an ocean view. Come at sunset for their happy hour! Stay here if: Your family is happiest on the beach. 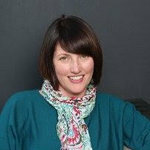 Valerie is the head of Guest Care at Vacatia. Having traveled the world for many years, she brings her love of exploration to help families find their next adventure. 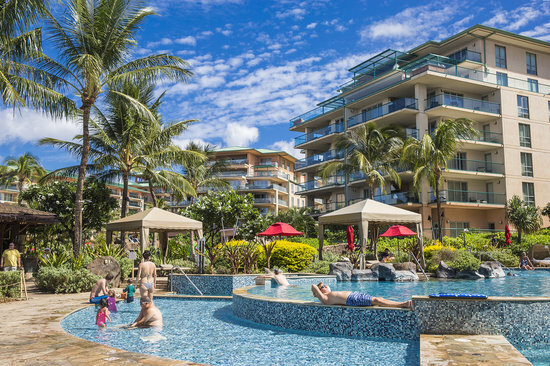 With three unique pools, a mini golf course, massage cabanas, and several on-site restaurants, it's an action-packed family resort, right on Ka'anapali Beach. You’re a close walk to a local park and farmers market, and five minutes from shopping and dining. Relax by the quiet seaside pool or walk out to the reef for snorkeling. 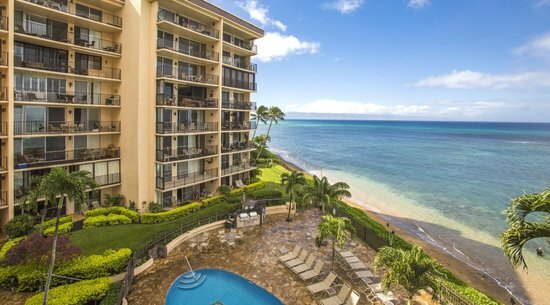 With easy access Ka’anapali Beach, this resort features lush gardens, multiple pools, and recently upgraded condos. 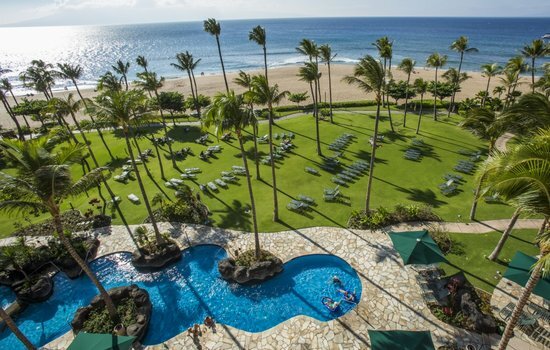 One of the most luxurious family resorts on Maui, Honua Kai offers a spectacular pool area, beachside restaurant, full-service spa, and unfettered access to Ka'anapali Beach. The gorgeous lawn stretches right out to the beach. 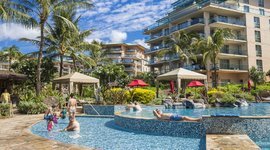 This family resort has a fun bar and restaurant, boogie board rentals on-site and is close to dining and shopping in Kihei. You're just one block from the art galleries, restaurants, and shops of historic Lahaina. 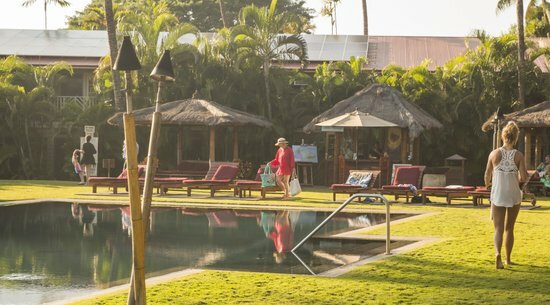 The resort also offers two gorgeous natural pools, bike rentals, and an activities shack. An expansive seaside lawn stretches out to the beach and is home to bocce ball, tennis courts, and other fun games. Large condos here feature spacious living rooms and full kitchens.